Slugs: We’d like to hear from you. 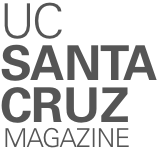 Send Alumni Notes to magazine@ucsc.edu, or submit a note via the web at alumni.ucsc.edu (go to Alumni Notes under Alumni Resources). ‘80 Jeffrey DIAMOND has been running two wine and cheese shops in the East Bay for nearly 15 years. ‘95 Mauricio BEUGELMANS has joined Schiff Hardin LLP as a partner in the San Francisco office. A member of the firm’s Commercial Litigation and Financial Markets and Products Practice Groups, he advises financial institutions on securities regulation and represents clients in securities and commercial litigation. ‘00 Nevada RUEHLEN, director of drinking water product development at HaloSource, is excited to announce the pending launch of the Astrea Lead Removal Bottle, Help kick the lead out at astreawater.com. ‘12 Nathaniel JENKINS joined the Sacramento office of employment and labor law practice Littler as an attorney. He represents and advises employers on a range of labor and employment law matters, including hiring, performance management, and termination; discrimination and harassment; and policies, procedures, and handbooks. Prior to joining Littler, Jenkins was an in-house attorney at a California state workforce agency. ‘73 Charles A. PERRONE is now professor emeritus of the Department of Spanish & Portuguese Studies, University of Florida. His latest book has recently appeared in paperback: Brazil, Lyric, and the Americas. Forty-five years after graduation he has returned to reside in Santa Cruz. ‘77 Judge Kelvin D. FILER, Los Angeles Superior Court in Compton, was inducted into the Hall of Fame for the John M. Langston Bar Association. ‘87 Chuck FLACKS started working to end homelessness at PATH Santa Barbara in November 2017. He runs their interim housing programs. He plans to marry Charla Bregante in May 2018, and celebrate the graduation of his daughter, Olivia, from Barnard College that same month! ‘93 Steffen ECKART recently joined Overcome the Barrier, a leading language skills training provider, to lead their business development efforts globally. He continues to be based in Tokyo, Japan, with his wife and son. ‘93 Robert LEBEAU joined the Whittier Trust Company of Nevada, Inc., as vice president, client advisor. LeBeau will provide financial and fiduciary services to high net worth individuals and their families and work closely with multi-generational relationships including grantors, trustees, beneficiaries, and business owners. ‘75 Eric M. BERG retired from the San Jose office of PricewaterhouseCoopers in August 2017 after 29 years with the firm, including seven years as a managing director. Between 2007 and 2017, Eric led the group that designed and enhanced Aura, the software used by PwC professionals around the world to perform and document audits. Eric continues to reside in the Redwood Shores area of Redwood City, Calif.
‘89 Clay Bonnyman EVANS’s new book, Bones of My Grandfather: Reclaiming a Lost Hero of WWII, will come out on July 3, 2018. The book tells the story of Evans’s grandfather, Alexander Bonnyman Jr., who was killed Nov. 22, 1943, in the Battle of Tarawa and posthumously awarded the Medal of Honor. Unbeknownst to their families, the remains of some 500 U.S. Marines and Navy personnel were never recovered from the island. In 2015, Evans was present when his grandfather’s remains were recovered. After a long career in journalism, Evans is now a freelance writer. ‘91 Gary GORDON, a finance executive with over 20 years of financial and administrative experience across multiple government sectors, will join Shedd Aquarium in Chicago as chief financial officer in April. ‘94 Jody GEHRMAN’s new novel, Watch Me, came out in late January. A gripping psychological thriller about a college student’s dark obsession with his professor, Watch Me plunges readers into a tense, twisty, and terrifying tale about how far obsession can go. ‘97 Herbert G. RUFFIN II, associate professor of history and chair of African American Studies at Syracuse University, coedited with Dwayne A. Mack a new book entitled Freedom’s Racial Frontier: African Americans in the Twentieth-Century West. The editors gathered established and emerging scholars in the field to create an anthology that links past, current, and future generations of African American West scholarship. Ruffin is also author of Uninvited Neighbors: African Americans in Silicon Valley, 1769–1990. ‘85 Daniel WEISS headed back last fall to Capitol Hill as chief of staff for House Democratic Leader Nancy Pelosi. He had spent the previous nearly three years working in Washington, D.C., as vice president for federal policy for San Francisco–based Common Sense Media and Common Sense Kids Action. He joined Common Sense after a long stint as chief of staff and committee aide to long-time champion for the environment, kids, and working families Congressman George Miller (D-CA). He continues to be impressed by UC Santa Cruz students and graduates he meets in D.C.
‘92 Ingrid WALKER is an associate professor of American studies at the University of Washington, Tacoma. She researches and teaches issues in contemporary American culture. She has a recently released book, High: Drugs, Desire and a Nation of Users. She says it’s an unusual but very UC Santa Cruz project—and a long time coming. She’s also done a related TEDx talk, Drugs and Desire. Find more information about both projects at Ingridkwalker.com. ‘79 Pamela C. VENTRA, MD, MA, Dip.P.M, passed away November 6, 2017, after a long battle with dementia. After graduating from College Eight [now Rachel Carson College], Dr. Ventra headed to UC San Diego School of Medicine. She earned additional degrees from Duquesne University and the University of Wales, Cardiff. She was a retired hospice physician.